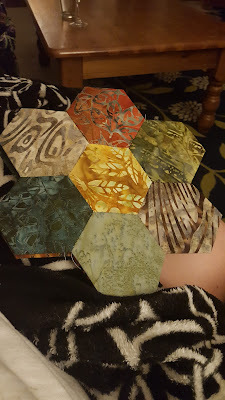 So I put plans for the quilt on hold until I could find the perfect fabric and learn how to sew hexagons to do it justice. Over the past few years I've built up my quilting skills with all these baby quilts and t-shirt quilts. I also started collecting fabrics. 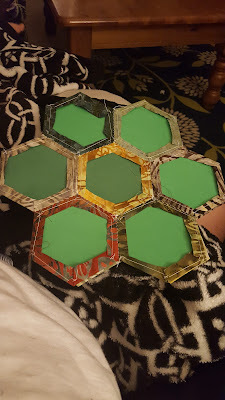 It was tricky; I want a balance between Obviously Catan Theme (cartoony pictures of bricks, sheep, etc) and just a regular old hexagon quilt. I searched long and hard and finally found some beautiful Batik fabrics on Fat Quarter Shop that struck the right note for me. nature themed, but in a Catan style color pallet. Wohoo! I cut up my fat quarters into 4x4.5 in rectangles and got started. 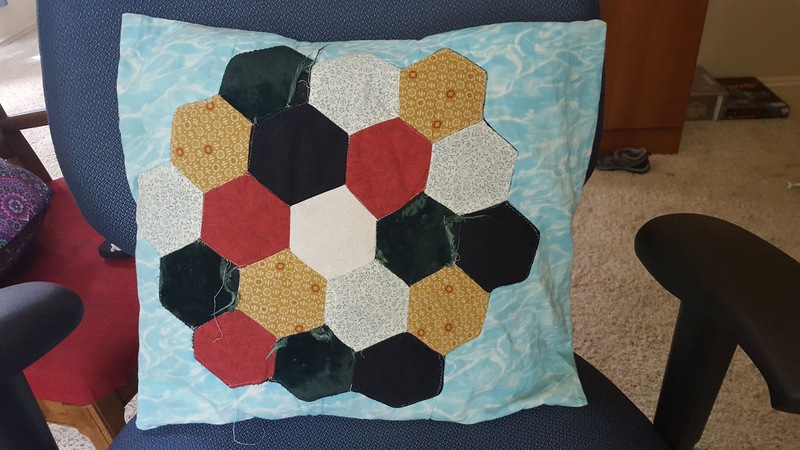 A rough calculation tells me that I will need about 1,300 hexagons to get a queen sized quilt. That' s 185 flowers. Not that many, in the scheme of things. My hexagons are MUCH bigger than quarters! Can you tell which hexes are brick, ore, wheat, sheep, and wood? I also put together a little on-the-go box for myself so that I can make hexes and flowers while I'm watching t.v. ( Venture Brothers and now Luke Cage) and so far I'm enjoying having something to do with my hands while we watch Netflix! 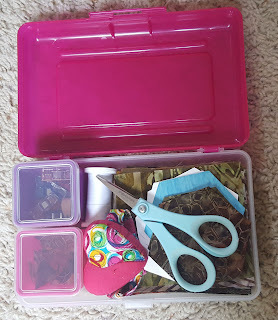 I tend to over-snack or else feel guilty when we binge shows instead of working on my sewing or writing, so I'm hoping that this project with help with those things. 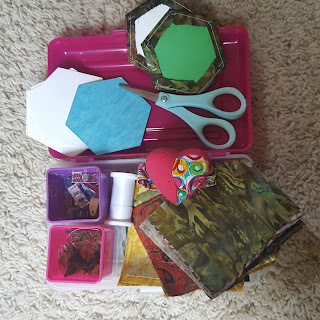 Plastic pencil box for portal hexagon-making. Kit includes snack container for scraps, container for binding clips, scissors, small pincushion with two needles, spool of thread, cut squares, paper templates, and an actual Catan hex. So. This is the beginning! 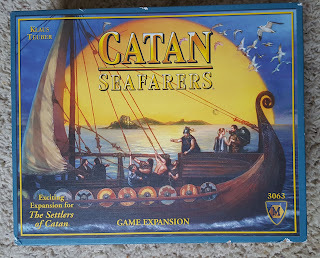 I'll post updates occasionally, but I expect this to take me a year minimum. 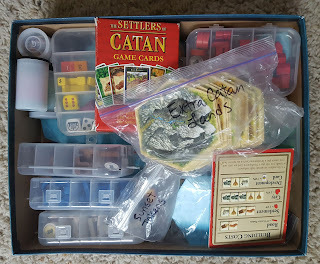 I expect I will need more fabric, and I'll need to play with the design. Do I want continents with water between? One giant continent with ocean around? Rivers? Islands? One comforting thought is that this is the first quilt that I am making just for me! I've made tons of quilts for other people, but never have I made one just for me. I guess it's about time!